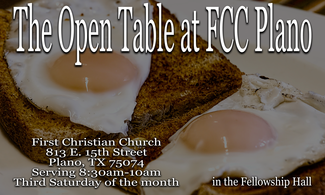 This is the UPDATED volunteer sign up for the Open Table at FCC Plano on the THIRD Saturday of the month. Our goal is community fellowship, in the form of a hot restaurant style breakfast, without pressure and without questions. Just food, love, and great music for those in our community. Any families or individuals in our community, and beyond, are welcome. This is a great opportunity for anyone with a servant's heart or would like to improve thier resume with some volunteer hours. Hours for volunteers vary, but are generally asked to arrive at 8am to help set-up and to stay through 1030am for clean up. Arrival times are based on job description. You may be asked to stay later, if guests are still arriving. Please sign up for jobs as able. Not all jobs are available for all, as some jobs require a food handler's license. Closed to shoes are a requirement, and hair must be pulled back. Clean up a requirement. Please park in back or side of Fellowship Hall as able. Do not block our neighbor's store front parking. Talks with those wanting fellowship. Gives encouragement. Delivers to go boxes of food and drinks to day labor center. Must stay in groups. FCC Volunteer rules must apply. 7:15am start packing bags, delivery made no later than 8. While delivering food, interact with and minister to the people present. Music to be played for our guests and volunteers. Hope to have music ready to start at 825-1030.